Grilled seaweed are the perfect snack! It is tasty (the most important quality in a snack), it contains a lot of essential nutrients and it is low in calories and fat. Also seaweed has a lot of fibers. 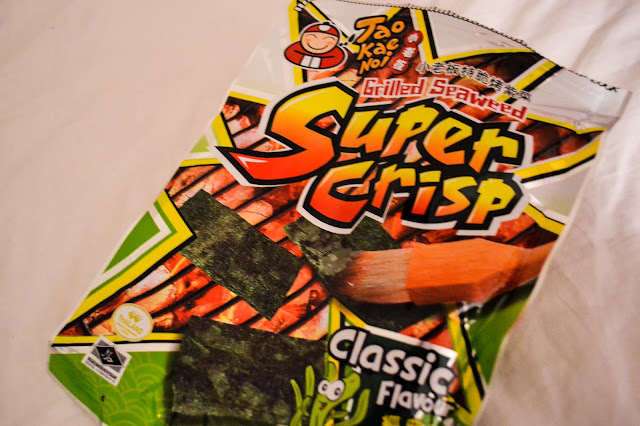 The entire bag of Grilled Seaweed Super Crisp contains 80 calories, 0 grams of fat and 25 grams of fiber. Perfect for those lazy days when you don't even bother to change out of your jammies and the only thing you do is to watch eight hours of your favorite series. You could eat three bags of Grilled Seaweed before you came up in the same amount of calories as there is in a small bag of chips. Amazing! The only bad thing with the Grilled Seaweed is that it is probably not available in your local food store. Go and look in the closest Thai or Chinese food store, they usually sell them there. Very sticky, but not at all icky!